I love the art of children. It's so honest and unpremeditated. While it doesn't always make sense to adults, it's an amazing tool that children use to make sense of their world. I love watching my son draw for that reason. We talk while he draws and it's amazing to see his imagination coming to life. THE ABC BOARD ART HANGER! My son has an ever growing collection of drawings/ sticker/ pom pom creations and my fridge space is limited. We needed something he could hang in his room to display his work.... and I thought I'd try to make it educational too by putting the alphabet on it. I took one of the boards that were left over from our new fence and gave it a coat of primer. Once that dried, I spray painted it this lovely happy green color... my fav! Next I did a lot of stencil work. I don't own a cricut or any machine of that sort, so made my own designs by hand and traced them out. It took quite a while. Once I had all the stencils painted in I gave it a nice coat of varnish. Then I glued the clothespins on. And wala! 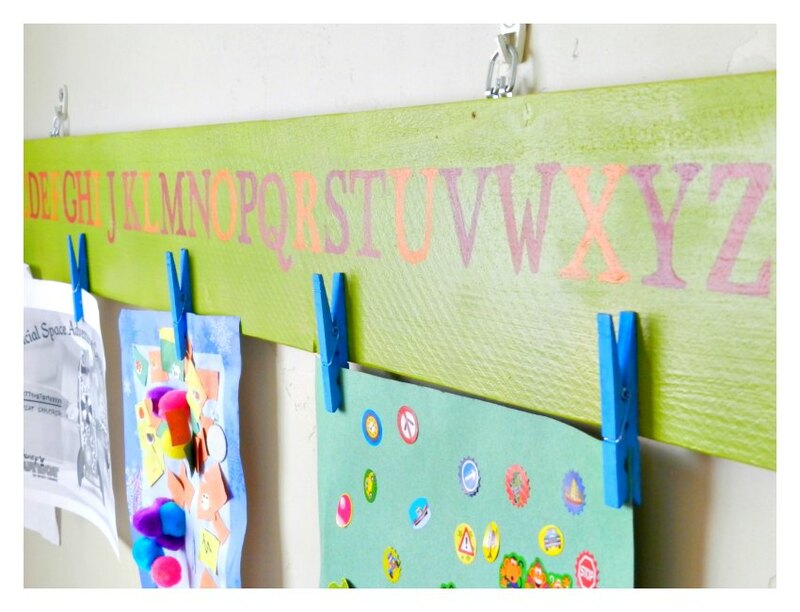 A beautiful and handy art hanger! This really brightens up the little guy's room. Dang, that is an awesome idea! I have a board laying around that is, well, just "bored." And about to be hung up in similar fashion in my art room!! Love it - thanks for sharing! Such a fabulous idea. My fridge has been overtaken by my little man's artwork and I've been wondering what to do with it. This would be perfect! I love this! You did an awesome job. This is so cute! I have a goal this year of displaying more of my boys' work, and this is such a cute way to do it. Thanks for the great idea! Pinning now! What a great idea. You can even personalize the board with the child's name. The revolving gallery approach is great. This a a great idea for a playroom or nursery. We always have too many art projects sitting in piles around our house.